Water Jumping Vine. MikeD shows off a Water Jumping Vine to show how in 3.0 there will be increased jumping height when leaving bodies of water. This is likely in response to annoyances over trying to get to slightly raised land masses when jumping out of the water. You can check out the vine here. (if the page doesn’t load, try a different browser). Or check out the .gif I created below (much lower quality and color): The jump height from leaving water is much higher than on live. You can see the massive Gyel Fortress in the background. Given the location of Gyel Fortress and the fact there’s water – this is possibly located around Rust Harbor. Trion @ PAX Prime: Trion is currently at PAX Prime. Join the “Trion Community Party” at 7PM PDT on Friday, August 29th at W Hotels (Seattle) in Seattle, Washington. Info on the event as well as what panels Trion will be at can be found here. 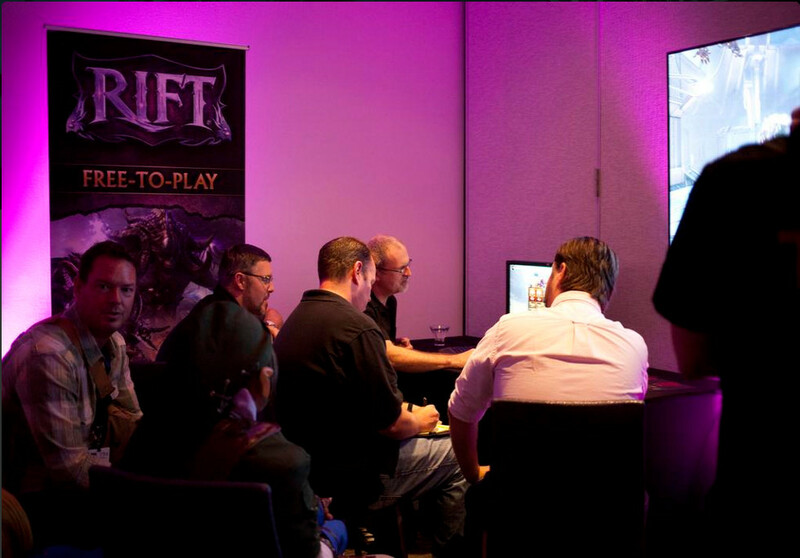 If you’re at PAX Prime, Trion Worlds is at Studio 2 & 3 on the 2nd Floor Gaming Center from 10AM to 4PM today! “Troll Combat 101: How to Handle and Defeat Internet Trolls” with Evan “Scapes” Berman (Senior Community Manager, Trion). “Photo Bomb Your Way to Success! How Jumping on Internet Fads/Trends Can Help Promote Your Game” with Eric “Ocho” Cleaver (Senior Community Manager, Trion). “Confessions of a Troll: Human Nature & Online Communication” with Eric “Ocho” Cleaver (Senior Community Manager, Trion). Here’s a shot of Dead Simon showing off RIFT to the media (and Link). Close inspection shows what could potentially be the Minion UI Window on the smaller screen and Tarken Glacier on the larger screen. The very top of the large screen looks like there’s a mechanical hand. @Valnimsil Why limit ourselves to just one announcement? Perhaps ArcheAge Release Date + RIFT 3.0 Expansion Release Date? We’ll just have to wait for someone at the Trion Community Party tonight to tweet it out for us! In the video (not “vine”), that almost looks inspired by the Space Jockey from Alien.